That thing was set up. The Daily Express was there before the cops came. In fact, Don Short had told us, “They’re coming to get you,” three weeks before. So, believe me, I’d cleaned the house out, because Jimi Hendrix had lived there before in the apartment, and I’m not stupid. I went through the whole damn house. As Bob Spitz points out, this bust was an indication that The Beatles’ relationship with the authorities, as well as the media, was changing. In the past they had always been pampered and protected by the powers that be. But now that they were turning into longhaired freaks instead of adorable moptops, the establishment was starting to think that they’d gone too far and needed to be reined it. It makes sense that John was the first to be targeted. 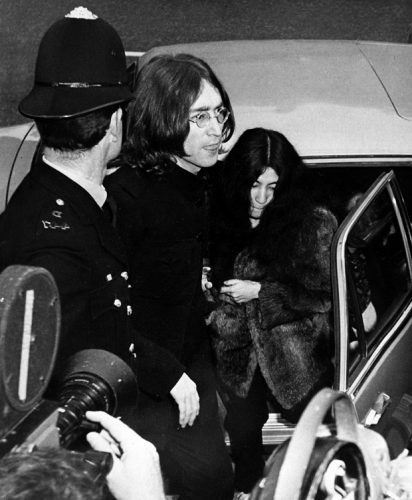 Not only was he the most outspoken, but his brazenly public affair with Yoko upset a lot of people — she was after all a foreigner, and not a cute white one like a German or something. She was an “Oriental,” as the nomenclature was designated at the time, and the backlash against her was often overtly racist. As we all know, it was the fans who eventually got him. But as with the Rolling Stones’ February 1967 drug bust, the press and the police were both key players in today’s raid. Cameras aplenty were on hand to record the Smart Beatle and his special lady friend being ignominiously marched through the street to a waiting police car. It is not impossible that the timing was actually not a coincidence. I hate to add any more conspiracy theories to the internet, but it is interesting that Lennon was allowed to finish his album before being busted, thus guaranteeing that EMI would get some return on all they had invested in the latest Beatle venture. Was someone at EMI in touch with someone at the Drugs Squad? Was the idea to throw a scare into The Beatles, and convince them to go back to being happy campers who made money for the Man and didn’t rock the boat? Probably not. But it makes you think.